In 1943, Mansyu undertook design of the Ki-98 single-seat ground attack aircraft. Of twin-boom configuration, it was to be powered by a 2,200 hp turbocharged Mitsubishi Ha-211 Ru radial engine mounted in the central nacelle behind the pilot's seat and driving a four blade propeller. Nose mounted armament consisted of one 37mm and two 20mm cannon. Its fuselage seems to be based on the Kyushu Shinden while the wings and tailplanes appear to be based on the P-38, but it is probably just coincidence. A prototype was still under construction when Japan surrendered. Maximum speed was projected to be 454 mph at 32,000 feet. Meng is a pretty new comer on the scene and so far, its products have gotten good reviews. This is the first of their kits that I have bought and it does not exactly fill the box. There are two sprues of grey plastic and a single clear sprue that contains the one-piece canopy. There are around 50 parts to this kit with the detailing consisting of nicely engraved panel lines. I would put them as somewhere between Airfix and Tamiya in terms of the size of the engraving. The cockpit tub has molded in rudder pedals and there is raised detail on the consoles and instrument panel. No belts are included so you will need to hit aftermarket for those. Having only a closed canopy option means that any real detailing work will not be as easily seen. The cockpit fits atop the nose gear well, which is a three piece construct of the roof and two sides. The nose and upper nose panel are separate pieces and there is plenty of room for the nose weight that will be needed to keep this from tail sitting. The wings are five pieces with a lower center section and an upper and lower outer wing section. The center section has stubs on which the upper wings can fit so alignment will not be an issue. Each of the booms contains a main gear well, very much like a P-38 so one should not have much in the way of issues when it comes to aligning these. The horizontal stab is mounted high on the fins and there are nose caps for the front of the boom assembly. Landing gear are well formed and should be sturdy enough to hold the weight of the model. One can build this with the gear up, but the modeler will have to find or build a display stand for it. Meng's fold out instructions are very nicely done and have a very colorful cover that matches the box art. Several paint company references are provided and there are generic color call-outs as well. For markings, all are very much fictitious since the prototype was never completed. 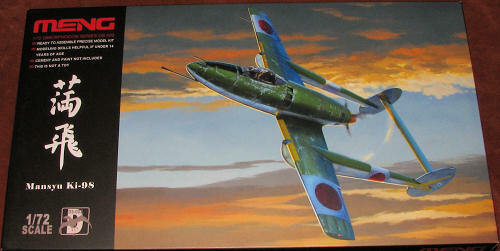 You get one Japanese plane as shown on the box art in 'Nakajima Green' uppers with unpainted metal for the rest of the airframe and a yellow prop spinner. This has white 'bandages' on the wings and booms for the insignia. Next is an all metal Manchukuo A.F. aircraft in unpainted metal overall. Finally, a Royal Thai plane in tan with green tiger stripes and a light grey underside. The decals are very nicely printed. While 'Luft 46' seems to have been quite a success, we have seen little being kitted for 'Japan 46'. This one is certainly a nice kit and while a bit pricey, it is probably due to the dearth of variants available for the molds. If you are into paper projects and those that were being built but never saw flight then this is one you should seriously consider. Japanese aircraft of the Pacific War, by Rene J. Francillon, second edition, 1979. Putnam. Thanks to me and consignment sales for the review kit.